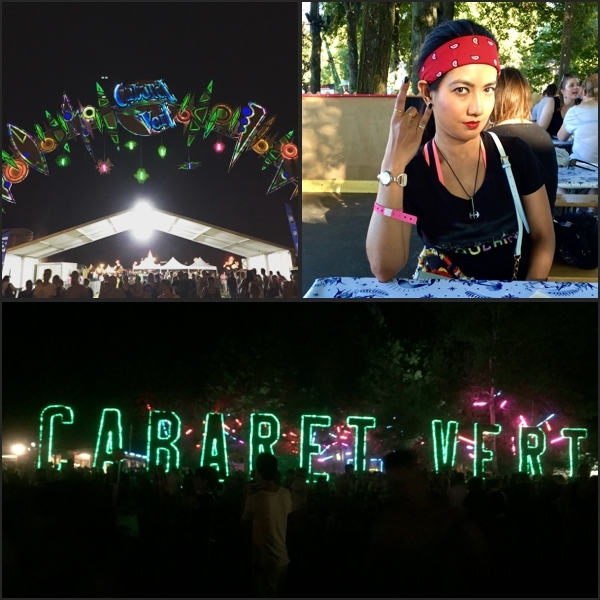 It was a sunny Saturday morning, the day after the rocking night with the French rock band Indochine at the opening of the Cabaret Vert rock festival. 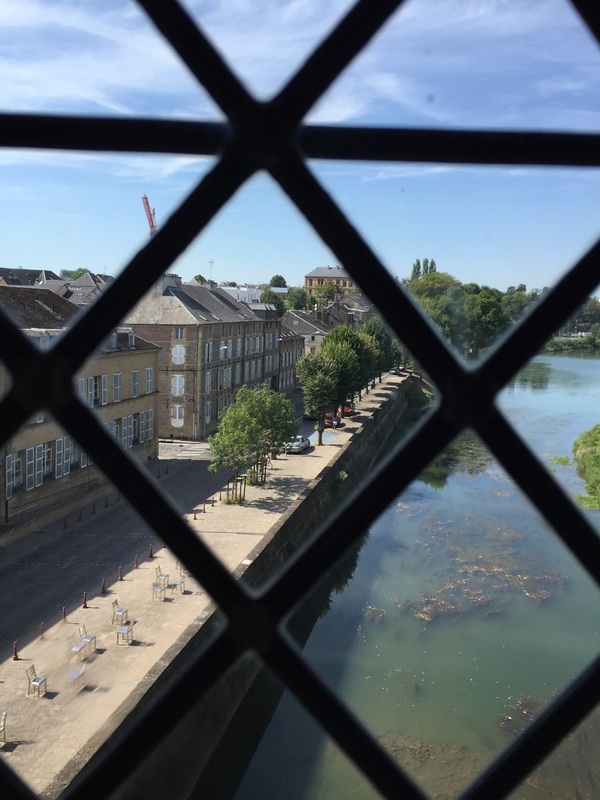 I checked out from the hotel with a back pack dangling from my shoulders and set out on the streets of Charleville-Mézières still in a daze. 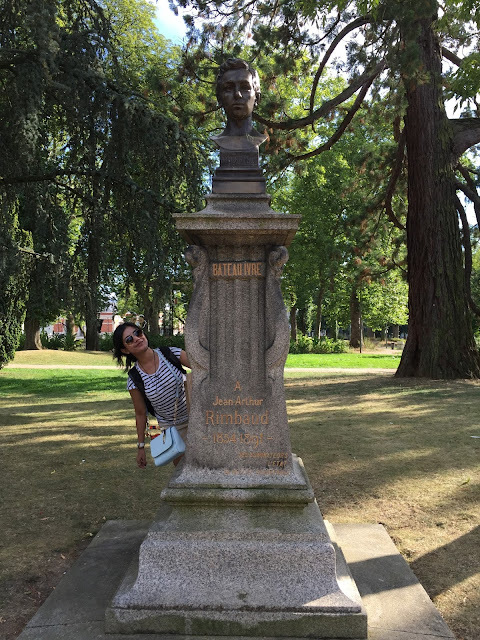 Musee Rimbaud and Place Ducale were on my check list but first I had to grab some tea to ease my headache due to lack of sleep. 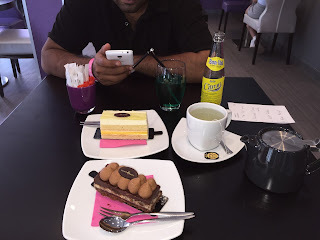 My first stop was at a small cafe where I had a croissant and a cup of tea, Mitra opted for pain au raisin and coffee. The cup of tea was an antidote to my headache. As I continued to walk down Rue de la Republique my eyes caught sight of the name "Librairie Rimbaud". In France bookstores are called libraire. 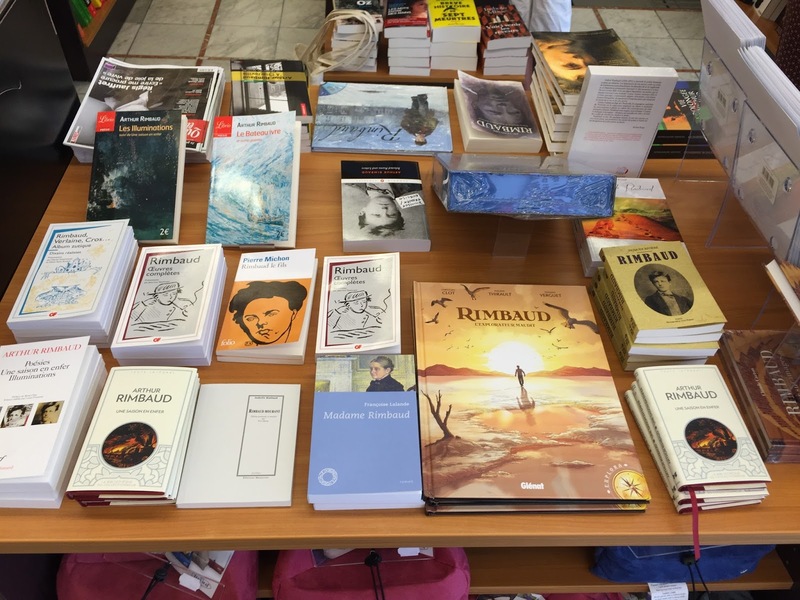 I knew that Charleville-Mézières was the birth place of the French poet Arthur Rimbaud and the book lover in me made its way into the store. 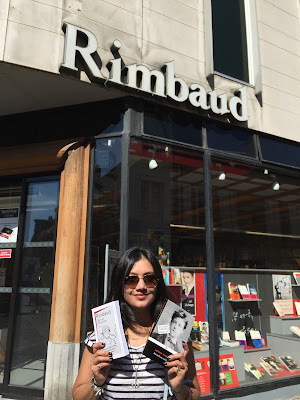 The bookstore was huge and had an extensive collection of Arthur Rimbaud's works including different bilingual versions. I bought for myself "Selected Poems and Letters" of Arthur Rimbaud from Penguin publishers & the best part was that it was a bilingual English-French version.I gifted Mitra the "Complete collection of Poems" of Arthur Rimbaud in its original version and its needless to say that it brought a big smile to his face. 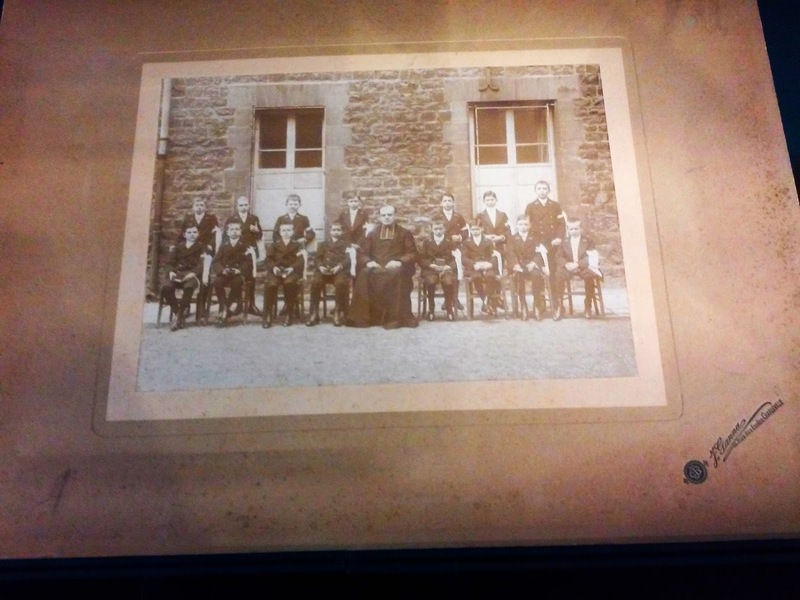 Other than these we gifted ourselves some nic-nacs like bookmarks and postcards all dedicated to Arthur Rimbaud. I was quite impressed with "Librairie Rimbaud" and must say that it is a must check during a trip to Charleville-Mézières. Monday: 14.00-19.00, Tuesday-Saturday: 10.00-19.00, Sunday Closed. By the time I came out of Libraire Rimbaud it was noon and we were both hungry. Without wasting anytime I went to Le Chene Cafe on Rue Pierre Bérégovoy where we ate the day before. 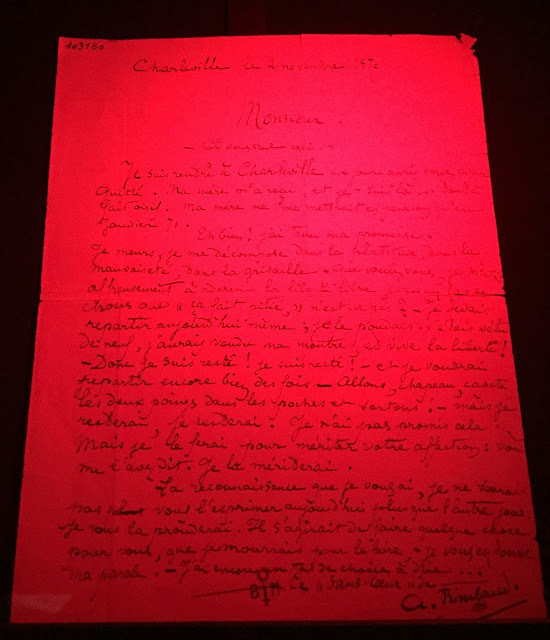 An interesting and important point to note is that the restaurant Le Chene Cafe is located in the same building where the poet Arthur Rimbaud was born in 1854. I opted for grilled Salmon and a glass of freshly pressed orange juice and Mitra opted for Steak Tartare and a glass of lemonade. Yes, it was an unusually hot day in Charleville-Mézières and the orange juice was a solace. 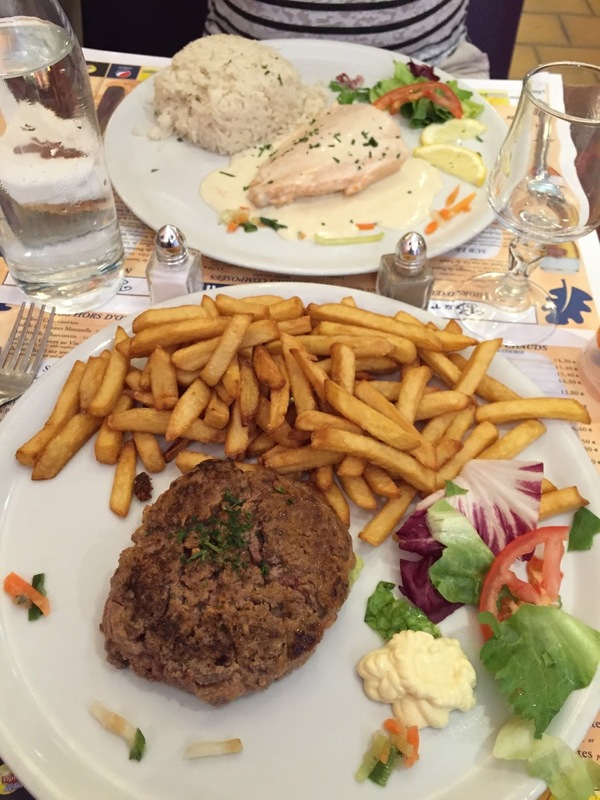 After devouring the food, I made my way towards Place Ducale. 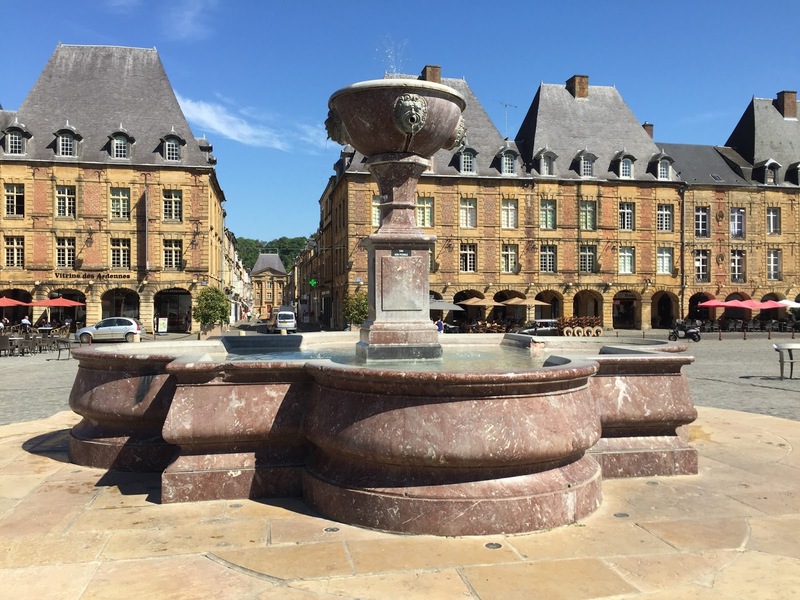 Place Ducale is the principle square of Charleville-Mézières and it was constructed way back in 1606 by Clément Métezeau. 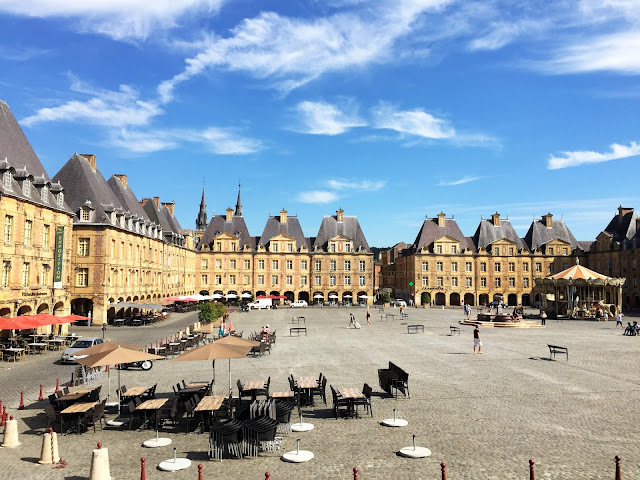 The square is a twin of Place des Vosges in Paris owing to its uncanny resemblance. There's a fountain in the middle of the square and to one side of it is a carousel. The Office of Tourism is at 4 Place Ducale and when I stepped on its patio my eyes caught sight of the array of buildings lining the square. I must say the panoramic view is magnificent and a photographer's delight. 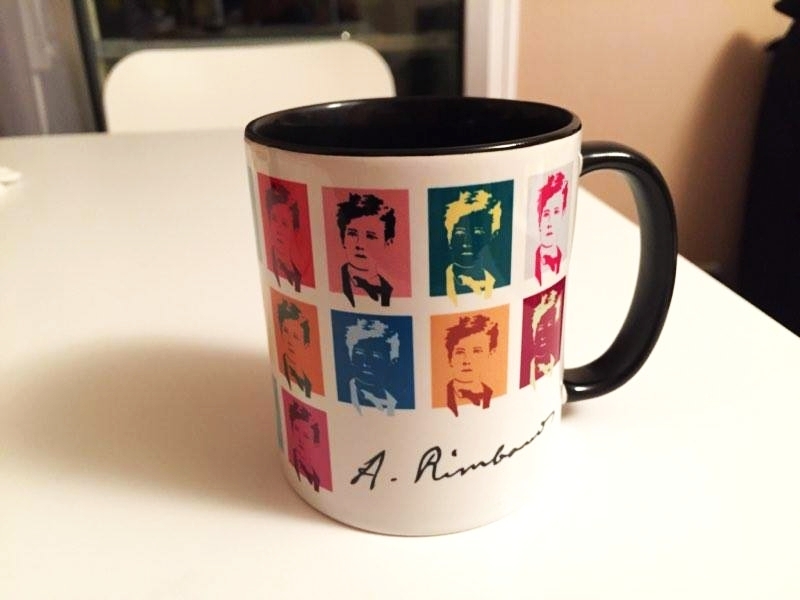 I bought an Andy Warhol's art inspired Arthur Rimbaud mug and a medallion of Charleville-Mézières from the Office of Tourism as a memento of my trip. 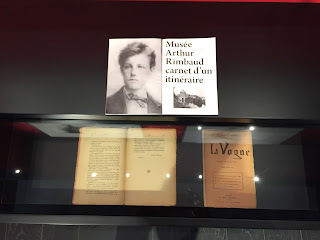 My next destination was Musee Rimbaud located on Quai Arthur Rimbaud and the main attraction of this museum are the hand written manuscripts of Arthur Rimbaud. 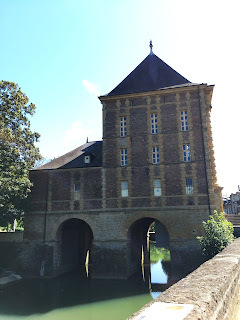 It is located in the north of the town in an old water mill on the bank of the river Meuse. After buying the ticket from the counter I was told to keep my back-pack in one of the lockers at the basement. The museum consists of four floors and the display starts from the top floor. Each floor has an information sheet hanging on the wall at the entrance. The famed handwritten manuscripts (3 of them) with a detailed description of each can be found on the 2nd floor. The manuscripts are kept in a dark room illuminated by only a dim IR lamp to protect them. 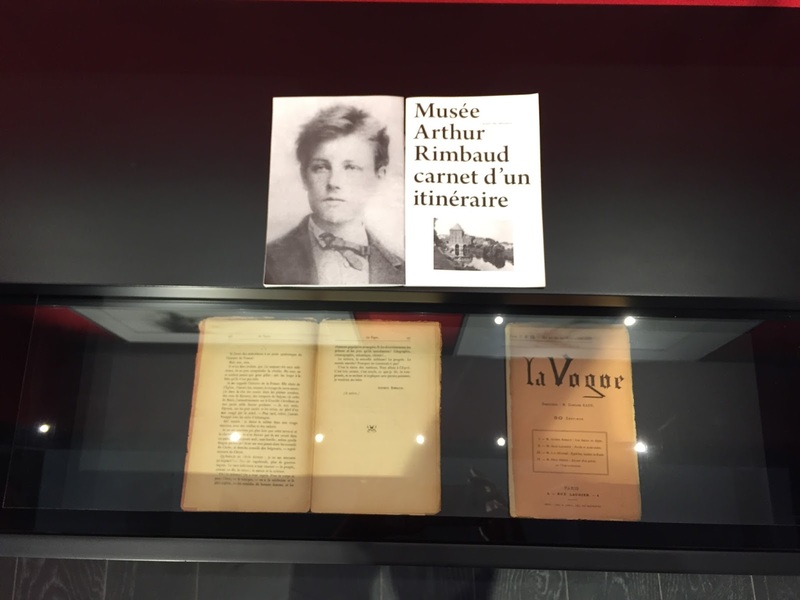 Apart from the manuscripts other relics relating to Arthur Rimbaud's life and mainly his childhood days can also be seen at the museum. Some of such exhibits include Rimbaud's high school awards, his first publication in the newspaper of Ardennes, the first fews copies of his early publications and a class-photo featuring the immortal poet during his primary school days. Tuesday-Sunday: 10.00-12.00 : 14.00-18.00, Monday Closed. It was now time to say good bye to Charleville-Mézières and so I made my way through the cobbled stone streets towards the station. On my way I paused for a tea break at Macarons et Plasirs. It is a quaint little tearoom plus pastry shop at Place Ducale. On touristic point of view, apart from being the birthplace of Arthur Rimbaud, Charleville-Mézières is also the "World Capital of Puppetry Arts" owing to the "International Puppet Festival " that takes place every three years since 1961. 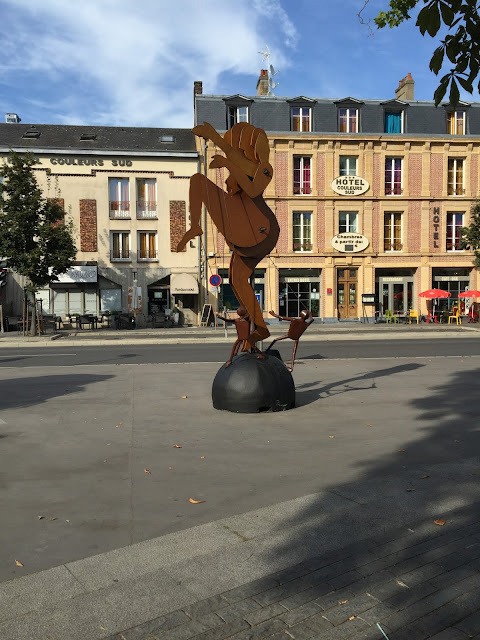 Before reaching the station, I had to pass through the Square de la Gare which has an open air exhibit of different puppets along with a natural landscape and pedestrian paths. With this I signed off from the birth place of Arthur Rimbaud and the world of puppets.